When making a backup of ROBOTLIB (daily backups, for instance), the product must be inactive. You can accomplish this with a CL program running from a Robot Schedule job. The following CL example saves only ROBOTLIB, but could be modified to save *ALLUSR, *NONSYS, or a list of libraries. A batch subsystem must be active for this example job to run. Robot Schedule 9 users only: If you use the Audit Log feature, you must deactivate it to achieve a successful backup. 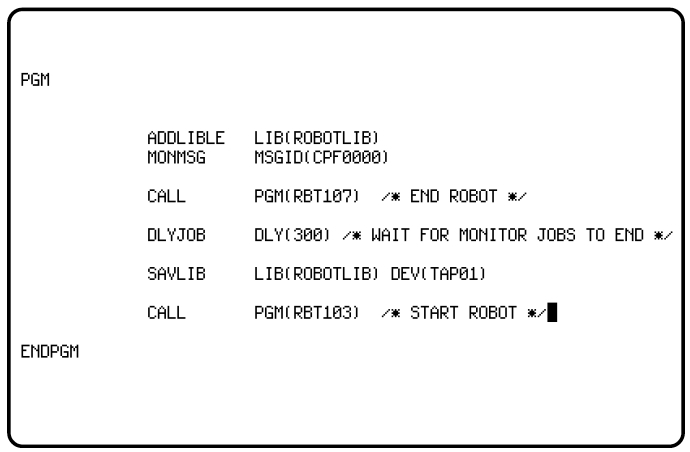 Create a program-type Robot Schedule job that calls the CL Program. Name the job the same name as the CL Program. Schedule this job to run with your daily backups.